It’s been quite a while since I was sternly told to turn my light off and go to sleep, but I still remember the agony of being half way through a nail biting chapter and being forced into darkness despite my protests. I’d smuggle torches up to bed, but they left the books with a strange glow, AND possibly resulted in my prescription now being -7! 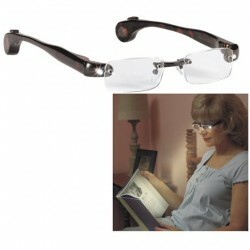 Well these glasses wouldn’t aid my vision, but they would make night time reading a little easier, as they feature LED lights above each lense. They’d keep my eyes from straining at night, and they’d also solve my reading-when walking -at -night-problem, but I realize that’s probably only applicable for me. They’re available at a strength of 0- +2.5, and you can also opt for a old lady style tortoiseshell print or plain black. Is it sad that I want a pair? They’re $29.99 from Catalog Favorites.